- s.s. 7 luglio 1976. Born in Kitzbühel (Austria, Tyrol) on 22th December, 1929. Full Professor for General Botany 1965, at the University of Innsbruck. Called as Professor for Plant Anatomy and Physiology at the University of Vienna 1975 (declined). Visiting Professor at the Universities of Padua (1974-1976, 1987/88), Sapporo (1981) and Seattle (1990). 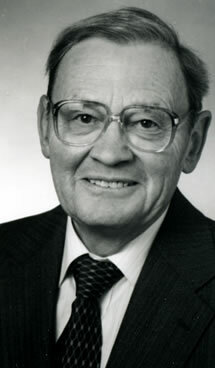 Dean of the Faculty of Science, University of Innsbruck (1987-1990). Accademia Galileiana di Scienze, Lettere ed Arti of Padova (1990). Research topics: Contributions to the comparative study of production physiology and of climatic stress of woody and herbaceous plant species from alpine, humid-temperate, mediterranean, subtropical and tropical regions. LARCHER, W.: Typology of freezing phenomena among vascular plants and evolutionary trends in frost acclimation. In: SAKAI, A., LI, P.H. (ed. ): Plant hardiness and freezing stress, II, 417-426. Academic Press, New York 1982. NAGELE M., LARCHER W.: Induzierbarkeit des Knospenaustriebs und Reaktivierbarkeit der Photosynthese als Indikatoren für den winterlichen Ruhezustand der Buche (Fagus sylvatica L.).In: R.ALBERT, K.BURIAN, H.KINZEL (Hrsg. ): Zustandserhebung Wienerwald, 69-92. Verlag der Österr.Akad.Wiss., Wien 1991. LARCHER W., NAGELE M.: Changes in photosynthetic activity of buds and stem tissues of Fagus sylvatica during winter. Trees 6, 91-95 (1992). LARCHER, W.: Effetti delle basse temperature invernali sulle piante sempreverdi mediterranee. L'Italia Forestale e Montana 46, 1-14 (1992). LARCHER, W.: Basi ecofisiologiche della produttivitá dei boschi. Ann.Accad.Ital.Sci.Forest. 41, 273-290 (1992). MORALES, D., JIMÉNEZ, M.S., WAGNER, J.,LARCHER, W.: Caracterización morfológica e histológica de las hojas de sol y sombra de Persea indica (L.)Spreng. y Persea americana Mill. Vieraea 21, 61-76 (1992). LARCHER, W.: Photosynthesis as a tool for indicating temperature stress events. In: SCHULZE E.-D., CALDWELL M.M. (eds. ): Ecophysiology of Photosynthesis, 261-277. Ecol.Studies 100. Springer, Berlin (1994) LARCHER, W.: In vitro fluorescence as a tool for non-invasive investigation of freezing stress. Chl Fluorescence Newsletter 2 (1), 3-6 (1994). LARCHER, W.: Hochgebirge: An den Grenzen des Wachstums. In: MORAWETZ W. (Hrsg. ): Ökologische Grundwerte in Österreich, 304-343. Biosystematics and Ecology Series, Österr.Akad.Wiss., Wien (1994). RASCIO, N., MARIANI P., DALLA VECCHIA F., ZANCHIN A., POOL A., LARCHER W.: Ultrastructural and photosynthetic features of leaves and stems of Elodea canadensis. J.Plant Physiol. 144, 314-324 (1994). LARCHER, W.:Introduccion a la ecofisiologia vegetal. In: MORALES, D. (ed. ): Tendencias en Ecofisiologia Vegetal, pp.5-18. Universidad de la Laguna (1994). GRATANI, L., TISI F., CRESCENTE M.F., PESOLI P., LARCHER W.: Phenology, leaf morphology and trends in CO2 uptake of Quercus ilex L. in the climax area and at its northern distribution limit in Italy. Arch.Geobot.2, 13-18 (1996). TISI, F., LARCHER W.: L'Arboreto di Arco. Museologia Scientifica 13, 291-308 (1996). WEN, H., WAGNER J., LARCHER W.: Growth and nocturnal acid accumulation during early ontogeny of Agave attenuata grown in nutrient solution and in vitro culture. Biologia plantarum 39, 1-11 (1997). LARCHER, W., WAGNER J., LÜTZ C.: Effect of heat on photosynthesis, dark respiration and cellular ultrastructure of the arctic-alpine psychrophyte Ranunculus glacialis. Photosynthetica 34, 219-232 (1997). NEUNER, G., BANNISTER P., LARCHER W.: A comparison of in situ measurements of frost resistance in Nothofagus menziesii with results from laboratory freezing tests. New Zealand J.Bot.35, 221-227 (1997). GRATANI, L., CRESCENTE, M.F., PESOLI, P., TIS, F., LARCHER, W.: Ritmo fenologico e caratteristiche morfologiche fogliari di Quercus ilex L., al limite nord del suo areale di distribuzione. Studi Trentini Sci.Nat. Acta Biol. 74 (1997), 15-20 (2000).